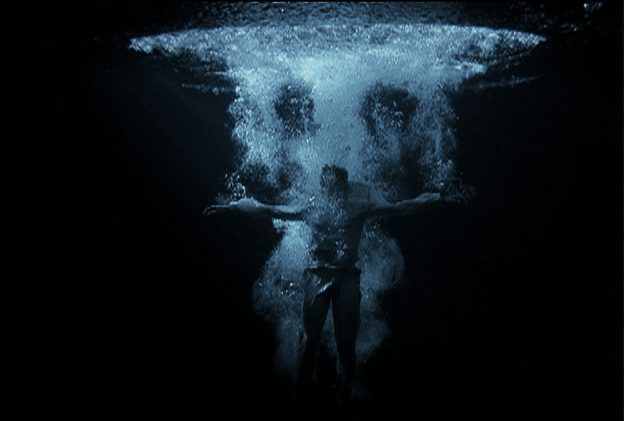 Bill Viola is a seminal figure in the field of video creating installations, films, sound environments, flat panel video pieces and works for concerts, opera and sacred spaces for over four decades. 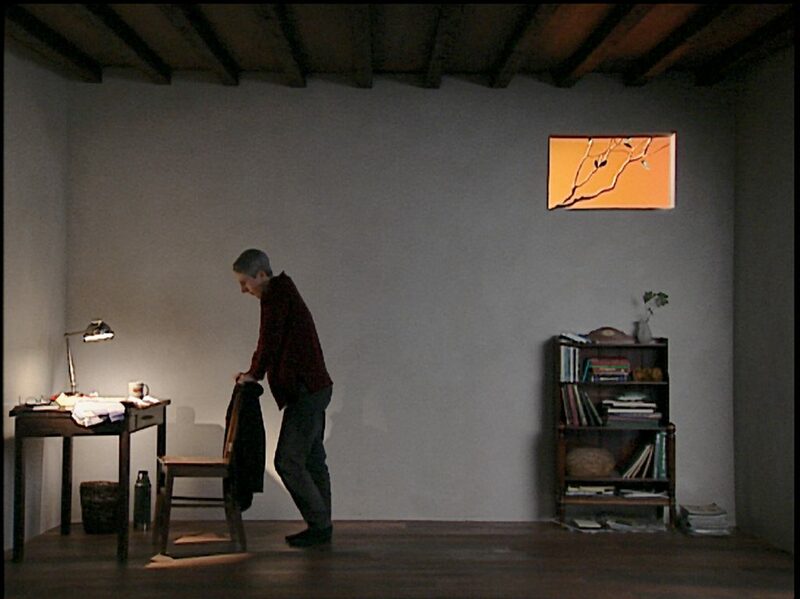 Viola uses video to explore the phenomenon of sense perception as an avenue to self-knowledge. His works focus on universal human experiences and have roots in both Eastern and Western art as well as spiritual traditions, including Zen Buddhism, Islamic Sufism, and Christian Mysticism. Using the inner language of subjective thoughts and collective memories, his videos communicate to a wide audience, allowing viewers to experience the work directly, and in their own personal way. 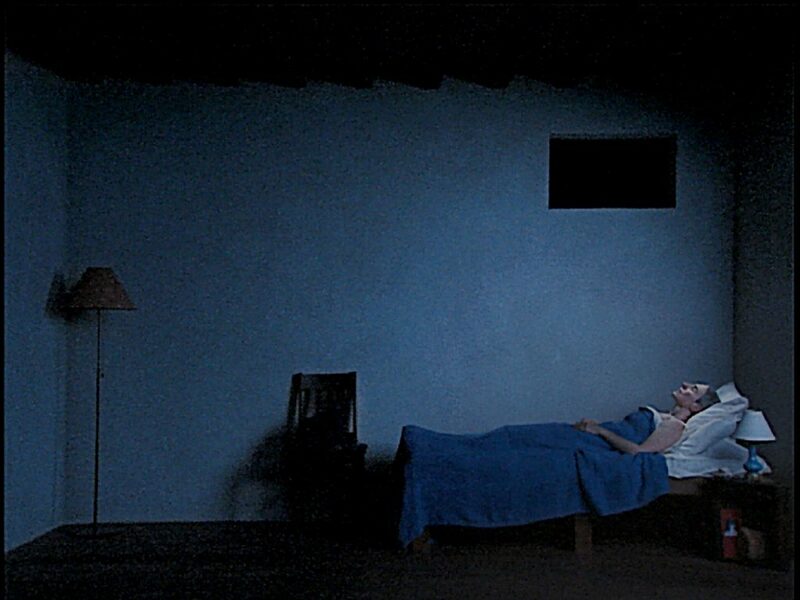 Bill Viola: Reasons for Knocking at an Empty House, 1982, Video/sound installation. (Photo: Collection of the Art Institute of Chicago.). 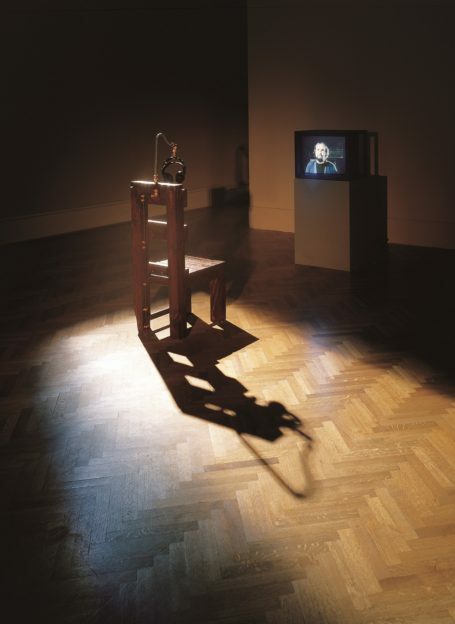 Reasons for Knocking at an Empty House, 1982, Video/sound installation. Where and how did you first encounter Buddhism? 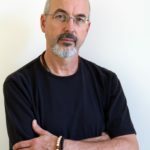 Bill Viola: As with many in my generation, I was first exposed to Buddhism and so-called Eastern philosophy through reading and meditation workshops in the late 1960s and early 70s. First hand experience came during several visits to Japan in the 1970s. I traveled to many of the major Buddhist temples, gardens and sacred sites. The sense of a palpable stillness and silence, reflected in the serene image of the Buddha’s face, was so different from my memories of being in church. This left an even deeper impression than the art and architecture I was ostensibly there to see. Then, in 1980 I received a Japan/U.S. Friendship Commission Fellowship to live in Japan with my wife Kira. During that period I had several experiences that changed my life and my understanding of art and its place in spiritual practice. The first came when we were at the Suntory Museum of Art in Tokyo to see an exhibition of art objects from a Buddhist temple in Kyoto. While standing before a row of life-sized Bodhisattva figures, reading the relevant facts and descriptions, a little old lady walked right past us and moved down the row, stopping to bow in silent prayer at each figure, placing a silk scarf over their outstretched hands. I was dumbstruck. This was an art museum! When the guards didn’t react, I was stunned. At that moment, the living practice, the living art in these works shone through, and I felt like someone who had for years been admiring the outer form of a computer without ever turning it on. Like a loud gong resounding in my brain, the reverberations of that statement are still with me. Could my precious art exist in service to something else, something much broader and deeper? Until that moment my measure of success in art resided within the confines of exhibiting in museums, galleries, and alternative art spaces. In Japan it was beginning to sink in that perhaps art resided in life itself, that as a practice it derives primarily from the quality of experience, depth of thought and devotion of the maker. Everything else—virtuosity with the materials, novelty of the idea or approach, innovation in craft or technique, skill of presentation, historical significance, importance of the venue—in short, almost everything I learned to value in art school, was secondary. Two channels of color video projections from opposite sides of a large dark gallery onto two large back-to-back screens suspended from ceiling and mounted to floor; four channels of amplified stereo sound, four speakers. What about practice? What has been your experience with teachers? 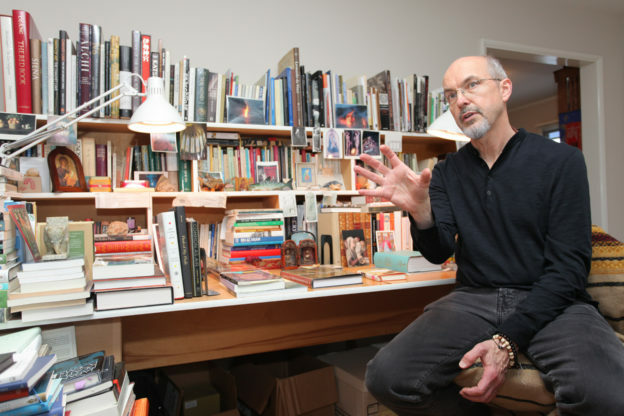 Bill Viola: I’ve been very lucky to meet the right teachers at the right time. In art school at Syracuse University I was fortunate to have Jack Nelson as my professor, an iconoclast and maverick who saw through institutional limitations. He established a new department called Experimental Studios (“the only rule is that there are no rules”), and gathered around him a group of students disillusioned with the status quo. He inspired us to be truly free with our creativity. I probably would have dropped out if I hadn’t met him. 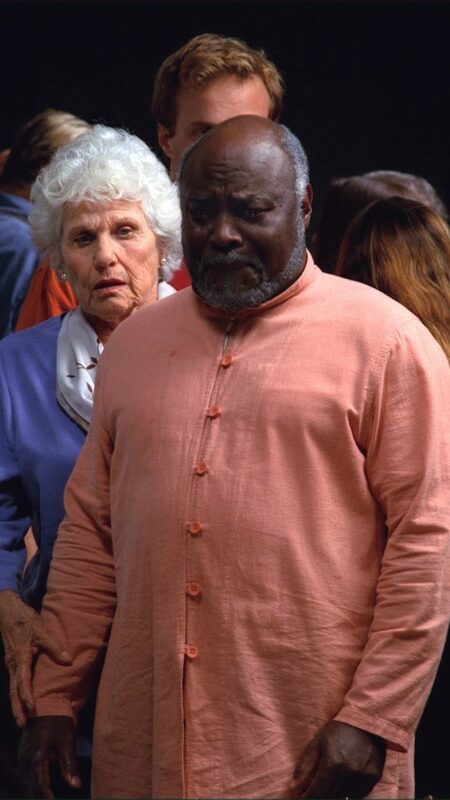 In Japan in 1980, Kira and I were both interested in pursuing Zen meditation, and through contact with a Shiatsu master in Tokyo we were introduced to a visiting Zen priest, Daiju Tanaka. We immediately connected. Tanaka Sensei was an independent free spirit, another maverick of sorts. Not associated with any temple, he traveled around the country visiting a loose association of friends and students. He knew very little English, yet the level of communication we had was deep, vivid and clear. Tanaka Sensei was also an artist. 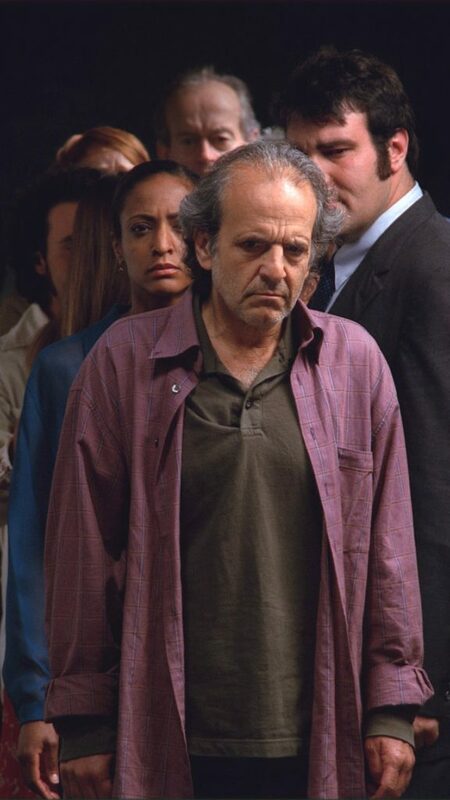 He was always working, freely, spontaneously, and fearlessly. We could be anywhere—in a restaurant, on a train, and he would suddenly call out: “Inspiration! Inspiration! Paper…Paper!” He’d grab a pen and quickly make a little Daruma face because that was the moment to make a Daruma face. I was witnessing art inserting itself into experience—where it needed to be, not where you wanted it to be—and it was very inspiring to see. Looking back, it’s very interesting that he didn’t’ teach me specifically to make art. I never asked him to, even though I had been frustrated in finding an ink-painting teacher. I guess he taught me how to BE art, not to how to make it. Once, while showing us his work, he pointed to two paintings, a detailed mountain landscape in the traditional Chinese style, and a roughly brushed, spare Zen-style picture. He said the elaborate one took 5 days to make, and the Zen one 5 seconds. “Equal! Equal!” he cried. “Five days equals five seconds!” I took this to mean that the quantity of technical effort, and pride in it, has no place in determining the merit of the work—particularly good advice for an artist working in the economically and technologically encumbered field of video art. How do you define your artistic practice? Do you consider yourself a video artist? 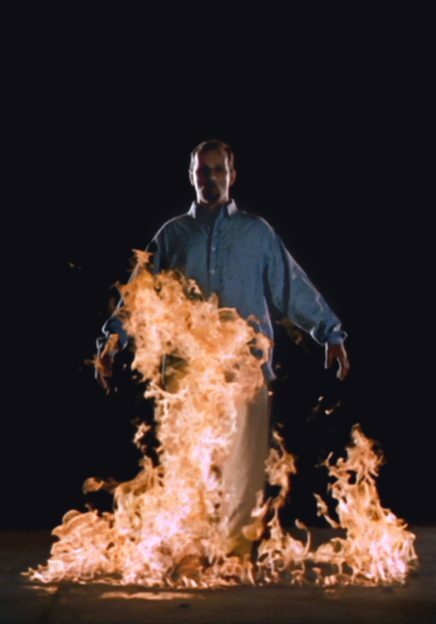 Bill Viola: A video artist? Not really. Of course, making art is my job, in the sense that it is an acknowledged profession with an organized, institutional structure and an economic base, and at the moment it pays the bills. However, it is also my practice in that it is a daily discipline based on action with the goal of greater self-awareness, both for myself and for the viewer. In this sense, it is an integral part of my life and not a label or occupation. I would say that the sum total of what we learned in Japan revolved around the idea of practice. That’s how all the Buddhists we were meeting described what they did everyday. The focus was on refining one’s actions, not the expounding of a theory. Of course, this was also what I did as an artist, as in the term “artistic practice,” and after living in Japan I realized that the two uses of the word seemed closer together than ever before. I had a hard time seeing this at first because in this age of academic art, when art training has moved out of the working community and into the insulated world of the university, becoming more theoretical in the process, the term practice no longer carries the same whole-life meaning. When I became exposed to art in a traditional context in Japan, I began to see traditional art forms not as stale artifacts from the past, but as active components of the present moment. The conservative function of museums tends to skew our perception of tradition towards the veneration of material objects and away from the living practice. As A.K. Coomaraswamy, the great 20th century curator and historian of art has said, “Museums are the places where we put the things we’ve forgotten how to use.” When Kira and I were in the room with Tanaka Sensei, we were in the living presence of his teacher, and his teacher’s teacher, and so on, in an unbroken line right back to the Buddha. This was an extraordinary thought—the palpable experience of transmission from being-to-being in the here-and-now. It vivified the idea of tradition, helping me to see its essential function not as the preservation of the past but as the activation of knowledge in the present moment. The present tense was the key, the vertical axis that cuts across all timelines, slicing through the layers of the canyon wall in one stroke, unifying past, present and future in the process. All sentient beings that have ever walked this earth have lived this moment. This is the common bond we share and the compassion we feel towards the dead. What is the place of the video medium in all this? 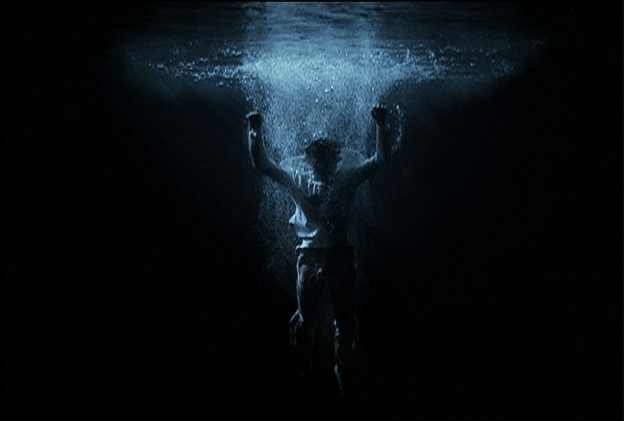 Bill Viola: We’ve been talking about the living spark that is in all people and the things they create, and video speaks in the language of sparks. Its image is not a fixed imprint on a piece of paper or the chemical residue on a physical strip of celluloid, but a living, vibrating pattern of electrical energy. It exists solely in the present moment. We call it “live.” Turn it off and the image vanishes without a trace. Nothing remains—only an empty shell of cold hardware. Like a musical chord, it is made up of varying frequencies that must be set into vibration to resonate in harmonic order for the system to function. A video signal travels at the speed of light, the speed of your thoughts, and this allows it to be transmitted and multiplied virtually instantaneously anywhere around the globe, yielding its most commonly perceived form, television. However, as an electrical signal it can also be recorded, and here’s where the connection to traditional culture comes in. When you record a home video, you are capturing a chunk of continuous time in the form of a sequence of scanned images and sounds. In playback, this then gets lifted out of the present moment and reinserted into the time flow at a later time and place. People then re-experience this window of displaced time as a symbolic representation, a kind of perceptual memory, re-inhabiting it and usually experiencing it at the pace in which it originally occurred. The dynamics of this process, an original event being codified into symbolic form and repeated and re-lived at a later time, mostly by people who were not there, bears a close resemblance to the function of ritual in traditional religious practices. It also embodies the idea we’ve been discussing of memory as an active component of the present moment. Now, if only some useful content could be transmitted in this way, then we’d really have something! 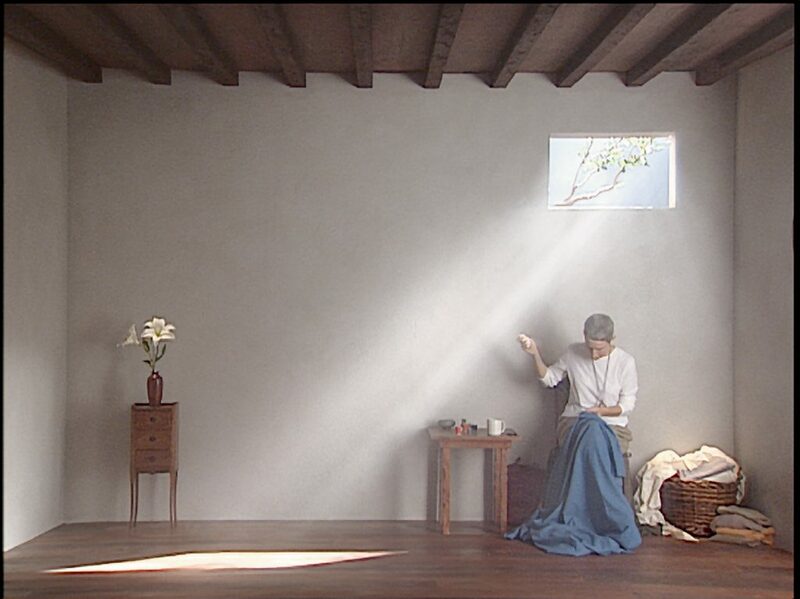 What has been the most useful aspect of your work with video in terms of spiritual practice? 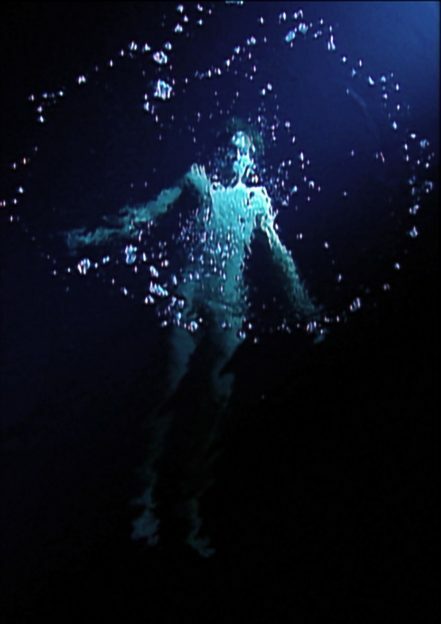 Bill Viola: Well, most people wouldn’t think of electronic technology as having an intrinsic spiritual aspect, but I feel it does. Spirituality is a field condition of life, not a special case limited only to a unique situation, a specific religion, or a certain object. There is a teaching present at every moment, an opening. Thomas Merton, the great 20th century Trappist monk said, “Being spiritual is something most people worry about when they are so busy with something else that they think they ought to be spiritual.” This is why the experience of the spiritual foundations of reality is described as a “realization” or “revelation,” that is, the awareness of something that already exists. Most spiritual disciplines are founded on the desire to teach the individual how to recognize this condition, primarily accomplished through the retraining of the faculties of sensory perception and mental awareness. Right from the start with video, I never fully invested in the independent ontological status of the image. How could I, when the first thing I saw looking through the viewfinder of the camera was a black and white image of the world live on a tiny video screen, not the familiar direct view through the optics of the lens? Life was immediately translated into an artificial image, one–step–removed from direct experience. Re-ordering and manipulating the recordings later in the dark confines of the editing room further reinforced the idea that these images were merely symbolic representations and could never be endowed with full authenticity. This was incredibly liberating artistically, since video images had by then attained the generally recognized status of realism in our culture, thanks to the mass media. The freedom to manipulate and even undermine images that corresponded so closely to people’s familiar perceptions allowed me to probe into the overlooked corners and invisible seams of our common experience. However, it didn’t take long to recognize that the so-called “direct view” I had lost staring into the electronic viewfinder was itself a tiny projection of light on the photosensitive surface of my retina, prone to misinterpretation and further manipulation by memory. This then begged the question, “Who is doing the looking?” and “What screening room are they in?” I am still searching for the answer to these questions. When you are shooting video, do you try to hold your mind in any particular way? Do you feel that the unique quality of your images is a reflection of your own experience as a perceiver? 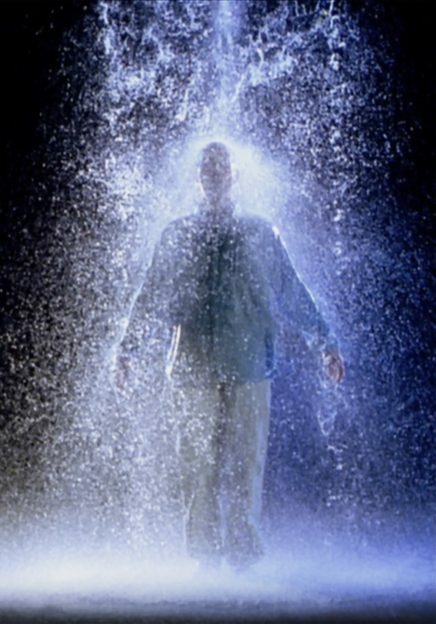 Bill Viola: Absolutely. Towards the end of university I had my first artistic crisis. I had been expending a huge effort to master the technology, which is correct since one has to first give oneself completely to the instrument involved so it can eventually become intuitive. But with all these machines around, something felt incomplete. I finally realized that I was studying only half the equation, and that the missing part was the viewer, absent and invisible when I picked up the camera, but essential. The technology I urgently needed to study now was the human hardware, the doors to perception—especially sight and hearing, along with cognition. I did my best with the materials at hand, mostly science books and some audited classes at the Institute for Perceptual Research on campus, but it wasn’t until I reached Japan that I deepened this awareness, primarily through Buddhism. Before sitting in Zazen, I never fully recognized that I had a mind to place somewhere, let alone misplace it. When sitting for extended periods with an experienced teacher, sentience became palpable. Like a fish slowly discovering water, I had occasional glimpses of mental awareness itself, as opposed to the contents of my mind. In my language, I was learning to see the screen, not the image. I thought of the Italian painters of the 14th century I had studied in art school, people like Giotto, who first recognized that the entire volume of space in the piazza they were painting was filled with light, even though they couldn’t see it. In the Zendo, during fifty minutes of silent sitting in a room of solitary individuals, time opens up in an extraordinary way. Space becomes active; breath is its measure and sound its dynamic form. The chirping of a little bird becomes an event of great magnitude. A minor itch, an unsettled stomach or a runny nose becomes either a curse or a blessing, depending on how we choose to reward it. Time as the clock tells it becomes irrelevant. Slow motion and high-speed become relative terms, as does the notion of a “successful” meditation. I think I became a better cameraman after my experiences with Zen in Japan, better able to accept images, to be vulnerable to them, instead of simply “taking” them. I also learned to how to work from a position of weakness, even though the masterpieces we studied in art school invariably gave me the impression of strength. Self-doubt has always been a part of my art practice, amplified by the expectations of my teachers incessantly echoing in my mind, “Not good enough!” It’s been rare that I’ve received a complete inspiration and worked effortlessly with great confidence to realize it. Making art has always been a struggle, and it took a while to recognize that this conflict was not due to my ineptitude but to the battle for control between my conscious and unconscious selves. I had to learn to have the confidence to get out of the way. The most difficult thing to reconcile, in life as well as art, is the gap between the depth of one’s feelings and the limitations of one’s abilities. As a visual artist, it took me a long time to recognize that the video medium was always showing me invisible things—the moment I first looked through a video camera, my first son’s first steps, the back of my head from across the room, an undesirable intention (a rejected image), a person as they appear at this moment on the other side of the world, the laughter of a long departed loved one, the thought that prompted these words as I spoke them one minute ago. All images became less like the optical record of an experience and more like a vision, that is, a combination of perception, feeling and memory. In other words, I was after an image that looked like how an experience felt to be inside it, and not how it appeared to an outside observer. I see the many images of the still, serene form of the Buddha as the representation of a moment in time, the point when liberation had finally come. Christians tend to place their central image at the point of the deepest suffering, the moment of the material death of the body. Both sequences ultimately lead to the same place, freedom from suffering, and both of these states, the torments and the release, find their representation in each religion. It’s where one chooses to place the frame on the timeline that distinguishes them. The goal of all images of consequence remains the same – liberation. Kira Perov is Executive Director of Bill Viola Studio. 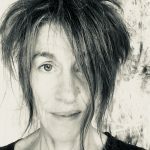 She has worked closely with Bill Viola since 1979, managing, creatively guiding and assisting with the production of his video works and installations. 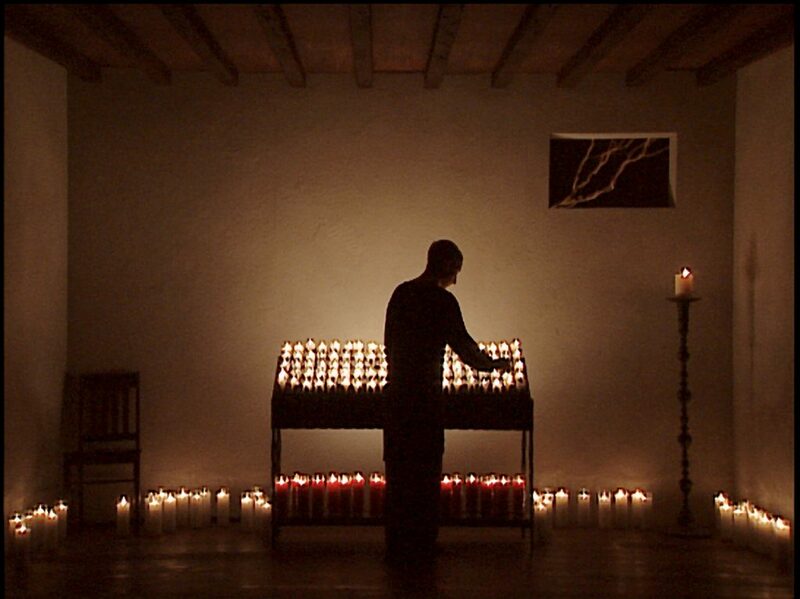 She edits all Bill Viola publications and organizes and coordinates exhibitions of the work worldwide.